Have you tried searching for hidden files or folders in a system? I am sure you never find it an easy task. But there is a free tool that will make this work easy for you. In Windows, you can search for hidden files and folders with a nice tool called Hidden File Finder. This nice tool can search for hidden files or folders based on your search criteria. And everything is so fast and simple. 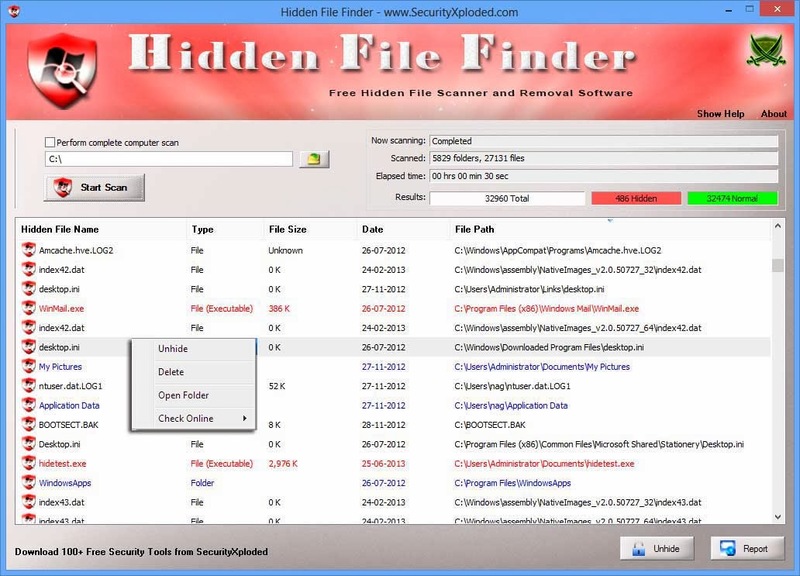 Hidden File Finder performs faster searching with its multi thread scan. It quickly scans all folders and drives and uncovers all hidden files and folders. It marks hidden executable files red for easier identification at quick glance. It also marked hidden folders in Blue and hidden files in black color. You can unhide a file of folder direct from the tool. If also shows notification whether it has successfully unhide the file or not. Most notable feature of the tool is that it can also scan the hidden file or folder using Virus Total. So, you will also able to see whether the hidden file is suspicious or not. Thus, you can also use this tool to perform a kind of virus scan. It can also generate the scan report in HTML if you need. The tool also has a portable version to carry with you. Delete all selected files and folders at once. It supports all available windows platforms including Windows XP, 2003, Vista, Windows 7 and Windows 8. This is really a nice tool for security purpose. It can help in finding a hidden suspicious file in your system. You can also use it to find what a person is hiding from you. One last thing that you should care while using the tool. It tries to install RegClean Pro upon installation. You can skip it in case you are not sure about that. It works good and is surely a must try tool.